I'm thrilled to be participating in the First Annual Scrap-Mart.com Blog Hop! If you are just joining in please go to the Scrap-Mart blog to start from the beginning. There are 31 blogs participating in the hop and you will find some great prizes along the way. I bet you are wondering why I'm not sharing a Holiday Project, since it is called a Holiday Blog Hop. We'll I've got a good reason - I'm one of the PRIZE Blogs, so I decided to create a project that uses the Prize Items (plus a few additional Heartfelt Creations Stamps/Dies). The beautiful flower was created with Heartfelt Creations HCPC 3318 Daisy Patch Flowers PreCut Set. I stamped the flowers in Chocolate on Rose card stock, then cut them out using Heartfelt Creations HCD 703 Daisy Patch Die, then sponged the edges in Chocolate. Staggering the Daisy, I layered Two Large, then one each of the next three size Daisies, adding a dimensional between each layer and a Center from Websters Pages. The leaves are from HCPC 3314 Elegant Single Leaves, stamped in Chocolate on Pear card stock then die cut using HCD 704 Perfect Petals. The Sentiment is from HCPC 3354 Classic Message embossed in Chocolate on Prima Pattern Paper. The lovely frame is HCD 708 Decorative Window Scene. To be eligible to win the following Heartfelt Creations items: HCPC 3318 Daisy Patch stamp set and HCD 703 Daisy Patch Die, simply leave a comment on this blog post by Sunday, December 5th. Thanks so much for stopping by, your next stop on the hop is Jenn's Blog. You must comment on the blog post that has the prize to be eligible to win that prize. There are also some Grand Prizes posted on the Scrap-Mart blog. You must comment on EVERY blog throughout the hop to be eligible for the Grand Prizes. Comments will remain open until midnight CST on Sunday, December 5th. Winners will be chosen at random for each individual prize and will be announced on the Scrap-Mart blog on Friday, December 10th. You may only win once. We'd like to thank our sponsors for generously donating all the prizes for this hop: Making Memories, Spellbinders, JustRite Stampers, Sizzix, Heartfelt Creations, Lifestyle Crafts, The Stamps of Life, Boss Kut, Unity Stamps, October Afternoon, Copic, Silhouette America. Ohhh... So beautiful! Love the flower and coordinating paper and frame. Gorgeous card! Oh Lisa, you have out done your self, this is jaw dropping gorgeous!!!! Amazing piece of beautiful art, you are such an enabler GF, I really need to get my hands on some of those . Once again I love heartfelt creation flowers...they really make a card a piece of art. Lovely. Beautiful card- thanks for sharing!! Lisa, this is beautiful! That flower is lovely! I love how you used that pretty frame. What a gorgeous card!!! Love all the detail! Now I'm going to have to get that stamp too. ;) Thanks so much for participating in our first blog hop!!! Your card is beautiful. I really like the soft background paper you used. Make your design that much more noticeable. I love how Heartfelt Creations creates stamps to fit with dies It makes projects so much more detailed. Beautiful use of the dies! I love how you always find the most perfectly matching paper for your designs! Wow!! Love this! Beautiful, I have never seen these gorgeous dies, where have I been?!!! Lisa, this is stunningly beautiful! that is a beautifully, detailed card. Love the flourish frame. What a fab color combination! that flower is awesome! well done! This is soooo pretty! I love the colors as well! This LOOKS really difficult, but somehow I think if you have the TOOLS, it's not so bad! I love all the little details. Thanks for sharing! Gorgeous! The dimension is superb!! Lovin' it!!! beautiful card - it looks just amazing! Great project - thanks for the chance to win! I just love that frame. Gorgeous project - thanks for sharing! That daisy almost looks like a dahlia, too! I love that shade of purple you chose. Love it. The flowers are just gorgeous! Thank you. Always love your work. Thanks for your creativity and inspiration. Amazing ideas. You do amazing work!! Your card is stunning! I am loving this blog hop! Gorgeous! 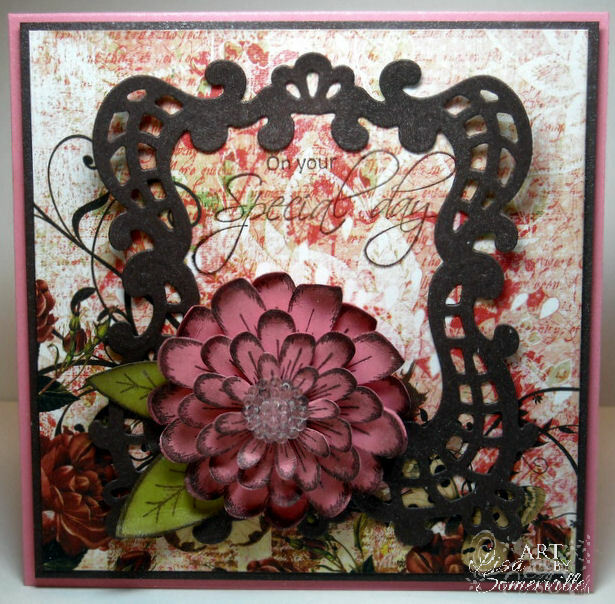 The use of the flowers and the window scene die cut is beautiful! That is one stunning flower. I love the colors you used. WOWzers that is so pretty!!!! What a beautiful card. I hope I win the supplies! That flower is so amazing. I love how realistic it looks! I LOVE the contrast of the Chocolate color. What a beautiful project! Can't get enough of those deep, rich colors! Oh my goodness. I am in love with your project. Absolutely gorgeous!!! Those Heartfelt stamps and dies are great! Gorgeous! Loving this blog hop! I'm getting overwhelmed with beauty! This is beautiful and I'm so glad you showcased the prize you're giving away. I love the untraditional feel of this! so cute! Your card is beautiful! I love your flower...the chocolate on rose is just gorgeous! Thanks so much for sharing! Is there something more than 3-D? I think you've captured it in that card. Beautiful work! It just looks so professional! Love it! WOW, WOW, and more WOW....I so love that decorative window die and your project is AMAZING!!! This card is really nice because you brought the focus where it belongs...and on printed paper this isn't easy to pull off...but you did. Great job! I love the elegeant look of the card. it is simply stunning. I'm also excited about the daisy patch punch and die. The background paper is perfect for the daisies you created with them! Great Projects. Thanks for the opportunity to win such awesome prizes. Beautiful project. What a fun blog-hop! What a beautiful card! i love the rose with the chocolate - very elegant! Gorgeous!! Simply gorgeous! The flower is my favorite part! That flower is just gorgeous! thanks for sharin. I hope I have the stamina to make it through them all, this is a long blog hop! Thanks for a chance at a lovely prize too! Wow, that flower is amazing! Wonderful projects and ideas! Thank you! Love your project. The chocolate around the petal edges really make them pop! Gorgeous flower! Thank you for the inspiration! This is a lovely design, I love the flower. Thanks for sharing. Very cute, would love to try this one! Happy Holidays! Beautiful card with so much detail! Love love love the flower!! Beautiful!! That card is absolutely beautiful! You are so talented! How beautiful!! I may have to try this out!! It's so beautiful, It would be hard to part with it. I love that flower!! it is beautiful!! I hope I can be the winner hehehehee... Thanks for sharing and for the giveaway! Very pretty. I may have to invest in the Window Scene die. I love the Heartfelt Creations flower....gorgeous!!! That flower is beautiful! It really looks great with the paper behind it. Lovely! You guys are great for sharing together like this and helping us learn and find new blogs. What a beautiful card. Love the flower. WOW so much details. Thanks for sharing your creativity! Really gorgeous card -- great stamps/die!!! TFS!!! Love the color combination and flower! Thanks for the chance to win some great prizes, and thanks for all the hard work creating all these projects!! What a beautiful daisy! Would love to have it. thanks for sharing. What a stunning flower. I love the chocolate ink that you used. Thank you. Really pretty colors on this card! you are SO crafty! so pretty!!! The flower is absolutely gorgeous, great color combination! very elegant, hope i win the prize. thanks for contributing. I'm floored by all the awesome ideas on this hop! Gorgeous flower - it could be used in so may different ways! Thanks! What great designs using some really nice materials! That flower is just amazing! I love how you've used chocolate ink, it just gives a softer feel to the rose color. It is a fabulous creation ~ tfs! WOW! That is the prettiest flower ever! It almost looks real! The frame is gorgeous too :) ! oh man! those colors are amazing!!! love your blog, thankful for the blog hop so I found it! I'm just beginning to learn about Heartfelt Creations stamps & dies, and what I've seen along this hop is amazing! The flower you created is just breath-takingly beautiful with those sponged edges in brown! The window scene diecut just puts this card over the top for me! Gorgeous details, TFS! Love the colors and the flower. Oh so elegant. Thanks for sharing these talents. stunning! great use of the prize elements. you are a hard act to follow. Oh wow. You know how to pump up the volume. It's beautiful. LOVE the flower.. especially the color choices. Lovin this blog hop thing! THat is a beautiful flower. It still looks Christmasy enough to me! Good choice of colors for an elegant look. Stopping in from the blog hop which is tons of fun. Gorgeous!! I love the 3D flower, beautiful project thank you! Wonderful card. Love the flower. That flower is a gotta have one. Wonderful job! i really like this project, thanks for sharing! Your card is absolutely gorgeous!! Love the way you colored the flowers and the die cuts work so well together. Great card! The flower is beautiful! Thanks for sharing. FABULOUS! I love the 3d flower! So pretty!! I ♥ the layered flower. Thanks for sharing!! There are no words to describe how gorgeous that flower is! Intricate and unique design! thank you for sharing! Your color choice is great. Thanks for sharing! So many wonderful details to your card. Oh this is gorgeous! Love that big flower, beautiful paper! What a great project! I love the flower!! Just gorgeous, Lisa! Love the beautiful frame and your layered flower is stunning! Love the colors that you used. Love the project. Heck what is there not to love? I love the 3D effect of the flower! Beautiful. Lisa, this is lovely! That Heartfelt Creations flower is stunning! So many wonderful details on your card! Beautiful flower! Thanks for joining us at Pals pare Arts! Your project is totally amazing! I love all the textures and that flower is to die for!!! Love that flower! Can't wait to explore your site more. That is such a pretty card. WOW!, Lisa!, that flower is amazing!! Thanks for sharing your lovely project. Love the Heartfelt Creation stamps. We have a few of them and they are gorgeous. How exciting! Those flowers are amazing. Love the colors. Wow the flower looks amazing! Thanks for the chance to win the stamp set and die! Love the card. . . it's beautiful!